I hope you enjoyed my blog on our trip to Newfoundland. I often bring my own food when I travel but am not always prepared to use as little waste as possible. This time I decided to make a conscious effort to make less waste. For this trip we traveled by ferry and car. We stayed in an Airbnb, a hotel and camped for 3 nights. I also employed some of the same things for a recent plane trip to Toronto. On the ferry and the plane planning ahead is the key. We brought our snacks and meals for the first day with us. This included breakfast for the next day. It was all packed in reusable containers such as mason jars and stainless steel . With all of the containers we needed for these meals, we could reuse them throughout the trip to carry lunches and snacks without having to purchase single use packaging. My husband drinks coffee so we brought a to go mug (our Keep Cup) to use in the mornings. I also brought a thermos as a back-up in case I wanted a hot drink. So we didn’t need to use plastic utensils I brought a set of stainless steel and one of bamboo. I also packed a stainless steel straw. For snacks I brought homemade snacks (banana bread muffin tops, granola bars and cookies), nuts and seeds, dried apricots. Each day I portioned out what we would need in our containers. I did bring some packaged protein bars to make sure we didn’t run out of food. We got groceries and stored them at our Airbnb. We ate breakfast there and packed a lunch to bring with us. Suppers we ate out. I always brought a container with us and we were able to take our leftovers home with us to eat the next day. I have a friend who has done this forever but this was the first time I thought of it. We got take out once while we were away. We had planned on eating out but the weather was terrible and all of the restaurants closed early. So I had French fries and my husband had a donair. We had one more grocery shop and picked up more supplies for camping. Most of our camping food came out of cans, which could be recycled. We had a bit of plastic soup mixes but I brought it home to recycle. Some of it came in boxes, which we burned on the fire. We also used our dryer lint as a fire starter and it worked really well. We both had a water bottle, which we filled at every opportunity. On days we needed extra water, we used a mason jar. I brought our sea salt (because I like it better and so that we didn’t need to use salt packets). I was extra careful not to forget anything so that we didn’t need to purchase more of something I already had. I brought a cloth napkin to use for spills and also if we got baked goods (to wrap them in). 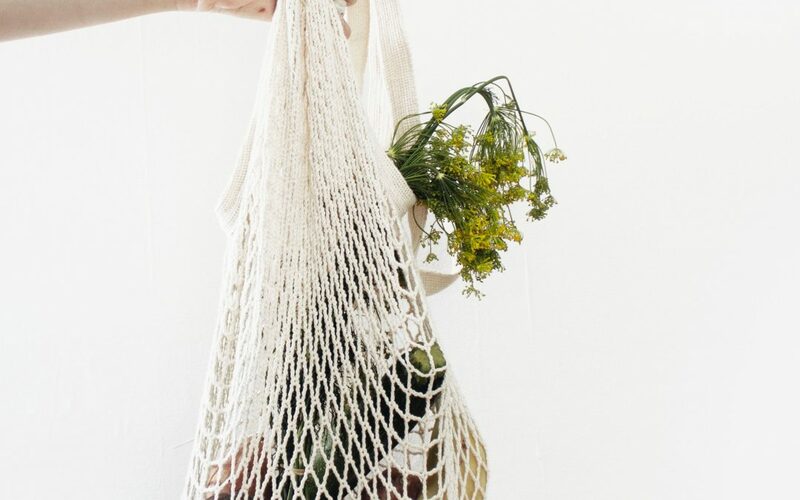 I had a number of cloth bags, which we used at the farmers market and at grocery stores. I packed a scarf to use as a blanket, towel and of course, a scarf. I suggest pre planning your food, researching restaurants and grocery stores. Find a farmers market if you can. We were by no means perfect on this trip but I found it quite easy to implement some of the things we do at home while travelling. It just took a tiny bit of extra planning.